First in a series recapping the 2010 Manhattan Cocktail Classic. Fear not, dear reader. Despite the grim title of this post, I had a great night out with friends old and new on the eve of the Manhattan Cocktail Classic. I had flown to New York a day early to celebrate World Cocktail Day as well as toast my First Blogiversary, a date I happened to share with Selena Ricks, author of The Dizzy Fizz. Tweets and texts were exchanged, and plans were made to convene at Death and Company, in the East Village. My first stop was the Waldorf=Astoria, where my friend Scot (The Red Bearded Hipster) was staying while he was in town for a few days on business. After I got settled in, we kicked off the festivities with Manhattans at Peacock Alley, the Waldorf’s lobby bar and restaurant. After a long flight (and what seemed like an even longer shuttle ride), it was exactly what I needed. Then we were off to Death & Co. Once we arrived in the East Village, we were met by Tom, a longtime friend of mine who had moved from LA to New York several years back. Tom was letting me crash at his East Village pad during the MCC, and his central location would prove to be a lifesaver more than once in the days ahead. 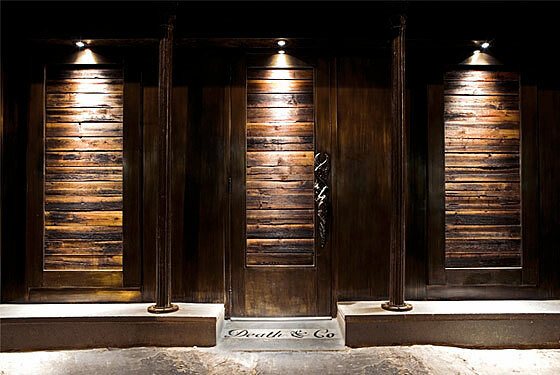 There was a queue outside Death & Co. as we walked up, but fortunately our friends already had a booth and we were allowed entry through the bar’s trademark wooden door. We sat down with quite the illustrious group: Lindsey Johnson and Ceci Norman from Lush Life Productions, Mindy Kucan (Anvil), and my blogger twin Selena. And behind the stick? None other than the CIC of the Drunken Army himself, Jason Littrell! My first time at Death & Co., and it already felt like home. The long and narrow space was appointed with sleek tables and a cherry wood ceiling, accented by kerosene lamps and custom chandeliers that added to the warm, intimate vibe. A quick scan of the detailed menu, and my eye drifted to the Honshu Punch: Yamazaki 12 Year Old Single Malt Whisky, fresh lemon juice, fresh pineapple juice, sugar cane syrup, Deragon’s Bitters, Fee Brothers Whiskey Barrel Aged Bitters, and club soda. It’s a cocktail right up my alley, wonderfully balanced between the medium-bodied whisky, fruit juices and bitters. 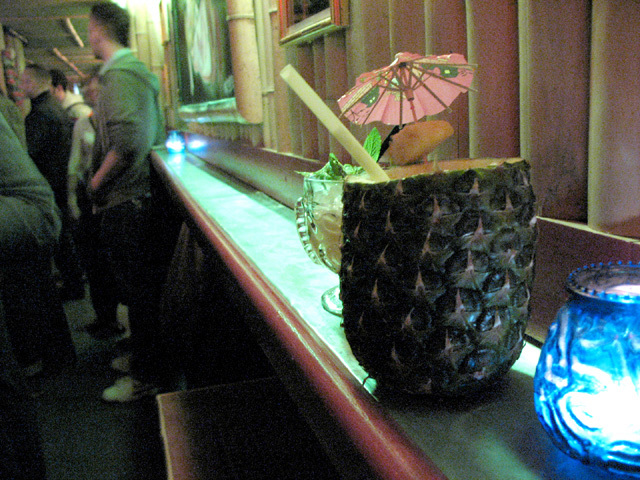 After a short walk and a much-needed slice at Ray’s, we arrived at Painkiller, the newly-opened tiki bar from Dutch Kills partners Richard Boccato and Giuseppe Gonzalez. Stepping into the bar, it’s immediately apparent that this is not your father’s tiki. 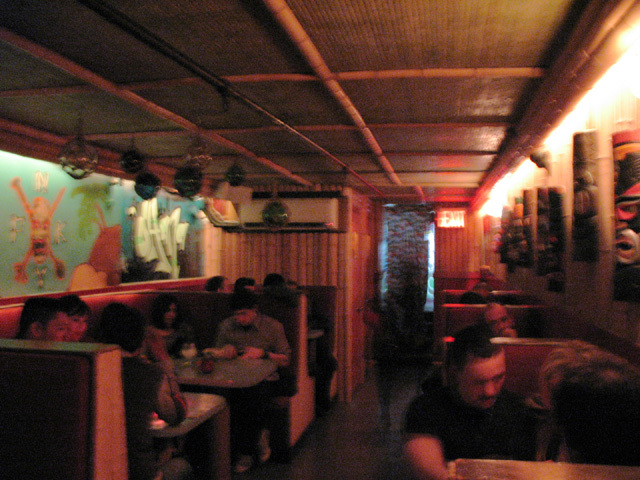 The decor reflects the team’s mantra, their belief that “Manhattan is the greatest island on Earth.” As such, Painkiller’s interior is a mash-up between Polynesian culture and 1970s Manhattan: bamboo covers the ceiling and lines the bar, walls, and shelves; in the back room, graffiti tags of “MAHALO” and “OHANA” cover one wall, while tiki masks line the other. The lighting cycles through colors periodically, occasionally lending a garish quality to the space. We noticed that this is not your modern New York cocktail den, either; as it got crowded later, people were actually allowed to stand at the bar. Lindsey and Ceci had to call it a night, but Selena and Mindy were already sipping drinks at the bar by the time we arrived. We were joined by Tom’s friend Sang, who’s in the early stages of a spirits project that I hope to share with my readers in the near future. We bellied up to the bar and dove right into a Scorpion Bowl, made with orange juice, lemon juice, orgeat, light rum and pisco. 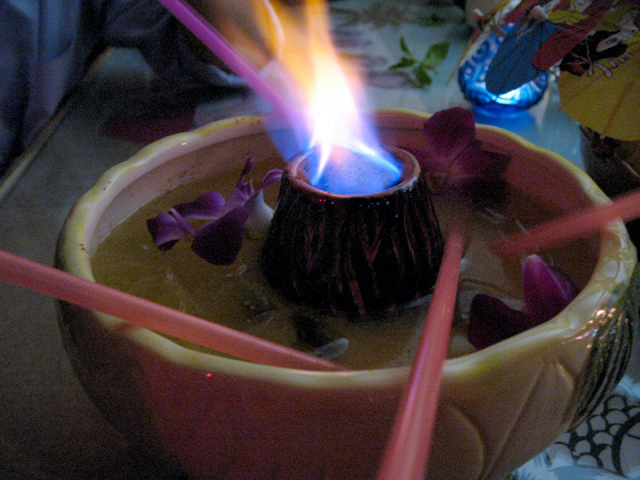 After the “volcano” is filled with Demerara 151 and lit, the bowl is garnished with gardenias and served. 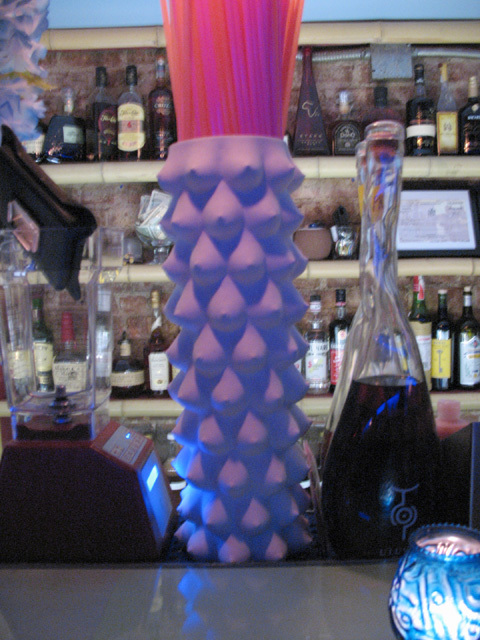 Four long straws were handed out and we sipped; male bonding, tiki-style! We assumed there was a kick to it, but as expected it was hard to tell. 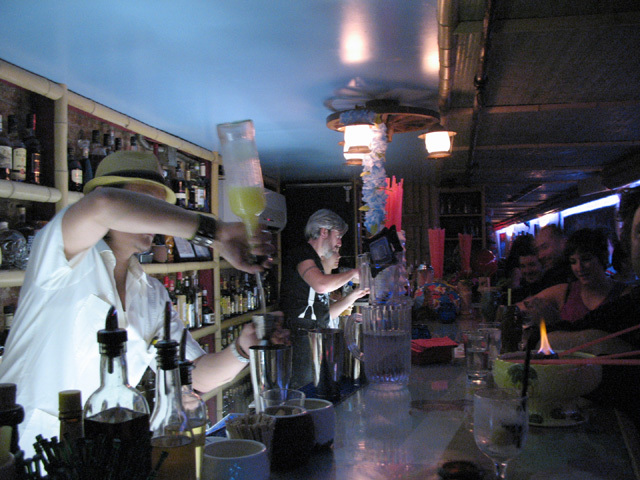 A refreshing, communal introduction to the Painkiller concept of New York tiki culture. Next up, Tom and I ordered the Painkiller Mai Tai, an interpretation of the Trader Vic’s classic: house-made orgeat, house-made curaçao, lime juice, Appleton V/X Jamaican rum, Rhum Agricole, and Lemon Hart Demerara rum (overproof). Served in a glass tiki mug and garnished with mint, a lime wedge and an orchid, it certainly has the look of another winner. Unfortunately that wasn’t the case. We couldn’t tell where it went wrong, but even my preference for the funk couldn’t get my palate around this one. Meanwhile Scot went with a Dark ‘n’ Frosty, a blended Dark ‘n’ Stormy variation made with Gosling’s Black Seal Rum, lime juice, ginger beer, and demerara syrup. By special request it was served in a pineapple. I missed the upfront ginger you get from a Dark ‘n’ Stormy, but after the Mai Tai a sip from that pineapple was heaven in a straw. As Selena took her leave, she warned us about how strong the drinks were. Needless to say, we didn’t pay attention and ordered a final round: an excellent Singapore Sling made with gin, lime juice, pineapple juice, grenadine, Cointreau, Bénédictine, Cherry Heering, and Angostura bitters. It’s served in a Collins glass, garnished with an orange slice and a cherry. This was the essence of tiki, a superb cocktail balanced between numerous flavors. And as we’d realize in the morning, as potent as it is enjoyable. In the wee hours, it hadn’t dawned on me that the Manhattan Cocktail Classic had yet to officially begin. All I knew was that I couldn’t have asked for a better way to spend World Cocktail Day and my First Blogiversary.